For long, we at eG Innovations have propagated the concept of “Collaborative Management” – something that Gartner analysts have also mentioned in recent times. Many organizations have looked at ITIL as a way to achieve IT service management excellence. Most of these initiatives are driven top-down in the organization. Often such ITIL initiatives take a long time to deliver or fail because there is no buy-in from within the organization. Success of these initiatives depends on how well the IT staff understands and appreciates what these initiatives seek to achieve, and how they can benefit the organization and the staff. An alternative approach that we’ve seen working – that too in a short timeframe – is a bottom-up approach. We call this the Collaborative Management approach because of the way in which it evolves and what it achieves. Typically, this approach starts with one group of IT experts seeking to understand how the other silos are performing. The reason to do this is because this group is often being blamed for service problems. For example, Citrix administrators are often faced with complaints such as “Citrix is slow” or “Citrix is not working”. 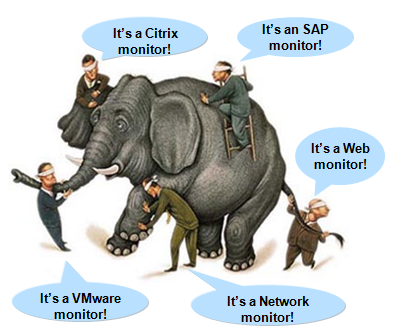 They look at all the Citrix application metrics and can’t find what’s wrong. Yet user complaints persist. These admins now want to know how the other components that are involved in supporting their service is performing – e.g., is the network working properly, and how the profile servers are doing, and what is going on with the database. To get this additional information, they will probably not have administrative access to these components. Hence, the monitoring tool they look for should be able to work with “incomplete visibility” into the infrastructure and still be able to deduce where the bottlenecks are in the infrastructure. Once this group finds metrics about the performance of the other domains, they can provide the evidence to the other groups. Not only is this information useful in fixing problems, it also gets the other groups interested in looking at a common monitoring console for metrics. Each domain administrator now wants to look at the common monitoring console and make sure that his/her domain cannot be blamed for a problem. At the same time, they are interested in seeing how the other domains are performing. This bottom approach provides an evolutionary model for achieving IT service management. As more domains get to use the common monitoring solution, you start to get complete end-to-end visibility. Be able to collect metrics about different domains without needing complete visibility into those domains. As more access becomes available, the monitoring solution should be able to provide greater visibility into these domains. The interesting part of a collaborative approach to service management is the way it evolves and how administrators think about it. 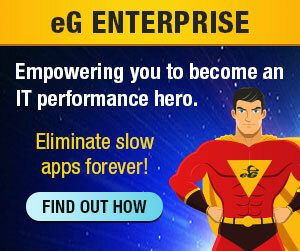 Enterprise-wide buy in is not required for its adoption. Collaborative management starts small and percolates into the organization as its value is demonstrated. This approach does not require all administrators to understand or believe in IT service management. The figure below summarizes how administrators look at the collaborative management solution. The Citrix admin looks at it as a Citrix monitor, while the database admin looks at the tool as a database monitoring solution. Sometimes the converse is also true – the Citrix administrator uses the tool to monitor the performance of the network (something he/she had no visibility to earlier) and the database administrator uses the tool to monitor the web front-end’s performance! In a whitepaper on this subject, we have provided a couple of real-world case studies highlighting how well this approach has worked in reality. Be sure to check this whitepaper here. Learn more about how IT service monitoring has been successfully implemented at Logic Springs.